Acer's first Ultrabook offering was met with lukewarm reviews, but being the least expensive and one the first to be available has apparently worked well for the company. Now, according to DigiTimes' sources within the supply chain, the Taiwanese manufacturer is looking to introduce an even cheaper option with a larger 15-inch screen "in view of satisfactory sales for its 11- to 13-inch ultrabook models." Whereas their 13-inch Aspire S3 debuted at $899 and is currently going for just $876 at Amazon, the upcoming 15-inch version will reportedly cost $699. The report doesn't quote any specifications or a launch time frame besides mentioning that Pegatron Technology will be responsible for ODM production. 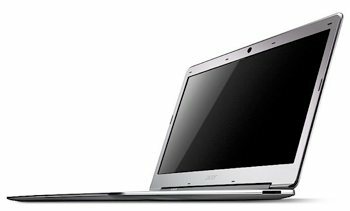 Acer's existing ultrabook models are outsourced to Wistron and global sales for those systems are expected to reach 250,000-300,000 units by the end of 2011. Interestingly, a couple of weeks ago Acer CEO J.T. Wang told Dow Jones his company would stop pursuing market share blindly with "cheap and unprofitable" products to focus on systems with good battery life, a thin design and lightweight construction. While getting behind the Ultrabook bandwagon seems consistent with that strategy, the $699 price point they're reportedly after suggests they aren't shy about cutting their margins. On a related note, Acer may not be alone in developing an ultrathin 15-inch notebook. Rumors have been circulating that Apple is working on a larger MacBook Air model (or thinner 15-inch MacBook Pro) that could debut in the first half of 2012. We wouldn't be surprised to see other 15-inch Ultrabook models next month as well, with manufacturers getting ready to announce their latest offerings during CES 2012 in Las Vegas.